Karen Sue Laughlin played her first music show when she was seven years old and has been hooked ever since. She is a small town girl from central Missouri with a lifelong dream of being an entertainer. With all glory to God, that dream has become her reality. Ms. Laughlin comes from a musically gifted family and is multi-instrumental. Her forte is harmonica playing as she is known in Mississippi as “the Blue-Eyed Blues Girl”. 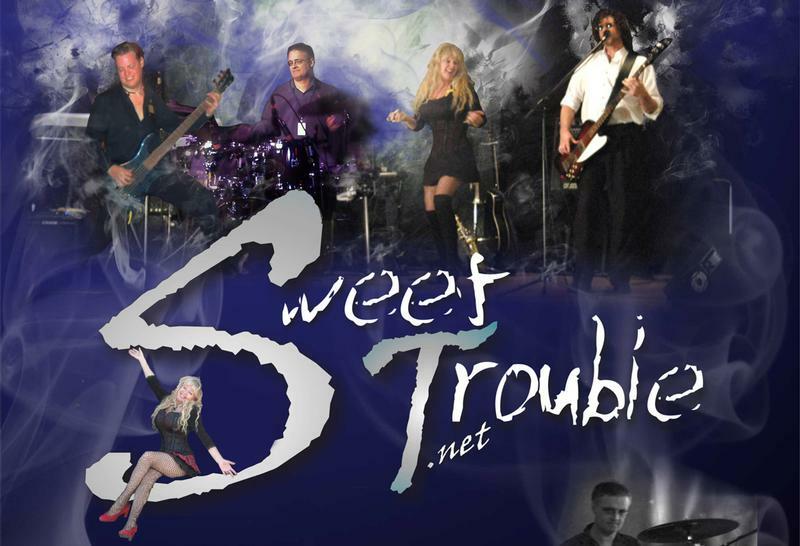 Sweet Trouble shows also feature her on guitar, keyboard, bass, flute, drums, and various percussion instruments. The musical styles she covers show variety as well: from blues to ballads and from Patsy Cline to Metallica. 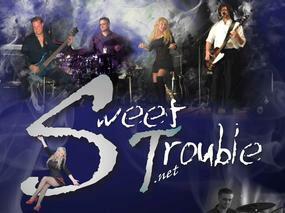 She loves playing and singing as well as interacting with Sweet Trouble’s audience and fans. She is truly grateful to the fans and her fellow musicians, and feels blessed to be a part of this musical journey. Andy Heimsoth was born a long time ago in a galaxy far, far away. Raised by wolves, he grew up with an aversion to haircuts. Due to this lack of follicular grooming, Andy was left with only one career option....Music. His education included a major in Rock History with electives in Blues Interpretation, Jazz 101, Nuclear Fusion, Big Band Theory, Advanced Motown, and Alpine Yodeling Appreciation. In 1993 Mr. Heimsoth graduated with a B.S. in Funkiness. He has since been seen assaulting guitars, basses, and microphones on various stages, flatbed trailers, and back yards throughout the Midwestern Territories. His extra-curricular activities include cross-country canoeing and indoor sky diving. Andy is also an admitted Kansas City Chiefs fan. When not on the road with Sweet Trouble, Mr. Heimsoth resides in the General State of Confusion. Daron Rogan hails from the Chicago area where he inherited his bass playing skills from his father. Daron’s past musical experience has included work with blues, country, and metal bands. His musical tastes, however, encompass a far wider range than any human being could possibly believe. Although Daron is often seen sporting colorful green and yellow outfits, he fervently claims that he is an avid Chicago Bears fan. He is also an enthusiastic supporter of the Cubs, Blackhawks, and the Buffalo Senior Citizen League co-ed croquet team. See Daron today at a live entertainment venue near you. Kyle Damon has been a drummer on the Kansas City music scene since 1990. A recent highlight of his career is touring the Midwest. Kyle's love of music started early on and he enjoys playing guitar in his downtime. 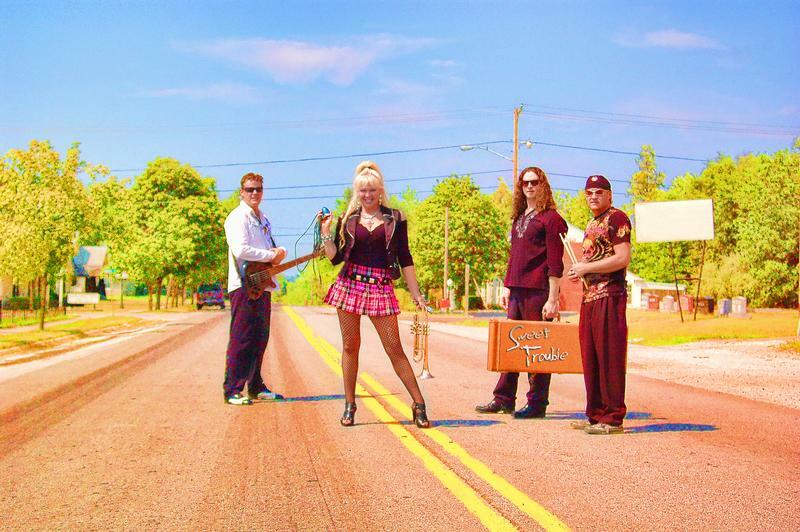 From high school to present day, Kyle has played a wide range of musical styles such as country, original rock, blues, and spent some time in a Boston tribute band. His musical influences are Keith Moon, John Bonham, Mike Portnoy , Tommy Lee, and Carter Beauford. Some of his favorite bands include Led Zeppelin, The Who, Snow Patrol, and Karnivool. He plans to continue his musical career with Sweet Trouble while evolving into a full time professional musician.